“Simply incredible! I cannot say anything anymore,” commented Bob Hanning, manager of Füchse Berlin, Hanning struggling to find the words to express his emotions after their sensational triumph at the IHF Super Globe. “Maybe this is one of the biggest surprises in handball of the past few years,” Hanning said. Two days after his team defeated the VELUX EHF Champions League winner FC Barcelona Lassa in the semi-final of the unofficial club World Championship, the 2015 EHF Cup champions left Champions League finalists MVM Veszprem behind empty-handed. The 27:28 win after extra-time was the first defeat for the Hungarian side this season after eleven straight wins. Barcelona completed the all-European dominance by winning the bronze medal. One would think that the semi-final win over Barcelona, which was secured by a penalty throw on the final buzzer, would have been the game of the tournament, but the final was even more exciting. And again one player was key to their success: Czech born Füchse goalkeeper Peter Stochl. His 16 saves paved the way for Füchse's second ever international title, after they won the EHF Cup on home ground last season. On the other hand, Veszprem lost their second straight final after the VELUX EHF FINAL4 defeat against Barcelona in Cologne. This is the second time a German club have taken the trophy in Doha after THW Kiel did in 2011. The whole final was like a roller coaster ride with constantly changing leads. 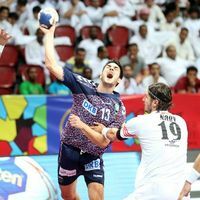 At the break, Berlin were ahead 15:13, then Veszprem forged ahead, helped by (an overall of eight) goals from line player Renato Sulic – but they could not manage to shake off their opponents. In the final stages of the second half, Stochl came into his own and with three minutes left on the clock, Füchse were even in the lead 24:23, before former Kiel player Aron Palmarsson secured extra-time for Veszprem. But in the 68 minute and thanks to two straight goals from their top scorer Kent Robin Tonnessen (6 in total), sealed the deal and Füchse were ahead by 28:26. “We are so proud of what we done here in Doha - beating Barcelona and Veszprem. We feel we are heroes now, but we have no time to celebrate, as in two days we have our next match in German league,” said Petar Neandic. Füchse will have their next international match in October, when they start their mission to defend the EHF Cup title in the third qualification round of the Group Phase. Veszprem and Barcelona start their ‘Cologne mission’ on 19 and 20 of September respectively in the VELUX EHF Champions League Group Phase. The Catalans did not have any problems leaving Sydney University behind with a 30:20 win in the bronze medal match in Doha.